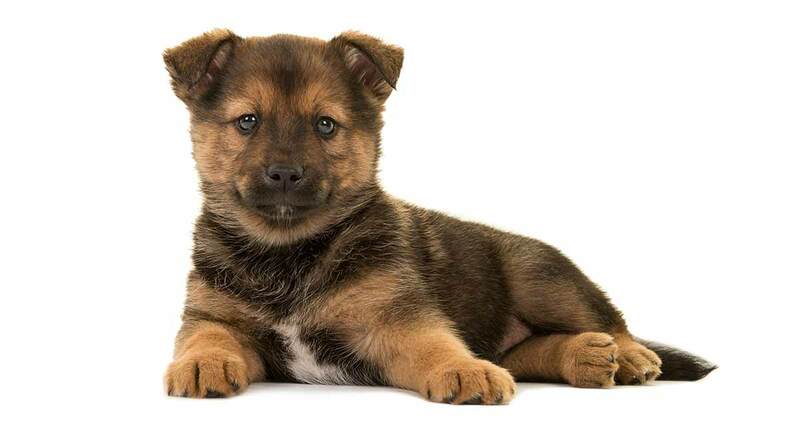 You are here: Home / Breeds / Pomeranian Mixes – Which Cute Cross Is Your Favorite? Pomeranian Mixes – Which Cute Cross Is Your Favorite? 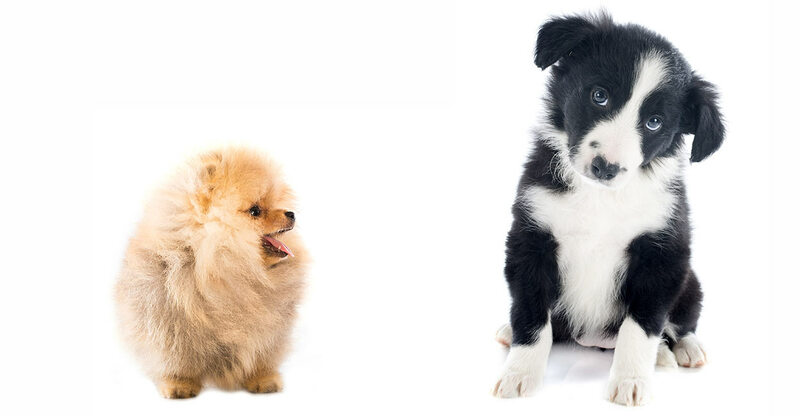 In this article, we will introduce you to some of the most popular Pomeranian mixes to help you choose your next pet dog! The Pomeranian has royal patrons to thank for the breed’s popularity today. Queen Victoria fell in love with this breed and began a formal breeding program, which helped introduce the mini Pomeranian to the world! Today, the Pomeranian is a popular choice for Pomeranian mix breeders for both this dog’s lively personality and winning appearance! 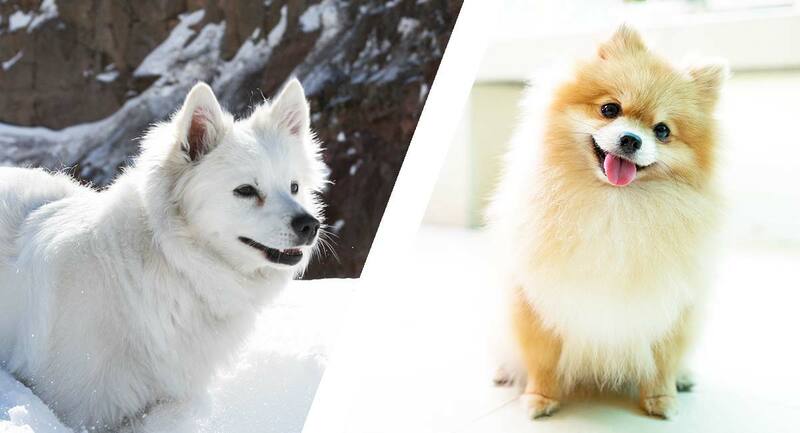 You only need to glance at a mug shot for the Pomeranian Boo, one of Instagram’s leading pup-celebrities, to understand the appeal of the Pomeranian dog breed. They are just so cute!! But the Pomeranian has more to recommend him than just adorable good looks. This dog is very smart, easily able to learn tricks and commands. The Pomeranian’s famous coat can require some maintenance to keep the skin healthy and prevent tangles and mats from forming. As well, the Pomeranian, like so many toy breed dogs, can be vulnerable to tracheal collapse, so these dogs often require a special harness rather than just a collar for leash walking. Toy breed dogs like the Pomeranian can be more challenging to housebreak simply because their bladders are so small. It can take up to a year to fully housetrain a Pomeranian. Mixed breed dogs are enjoying a wave of popularity right now. And Pomeranian mix dogs are no exception. The Pomeranian x Husky, or Pomsky as this hybrid dog is adorably called, is one of the most popular of the Pom mix breeds. Both the Pomeranian and the Husky originated as working sled dogs, although today’s Pomeranians are mostly expert lap warmers! A Husky Pomeranian mix can look surprisingly wolf-like, as Instagram celebrity Mya, a Pomeranian husky puppy, showcases. However, your Pomsky’s adult appearance can look quite different depending on which parent dog your puppy takes after the most. 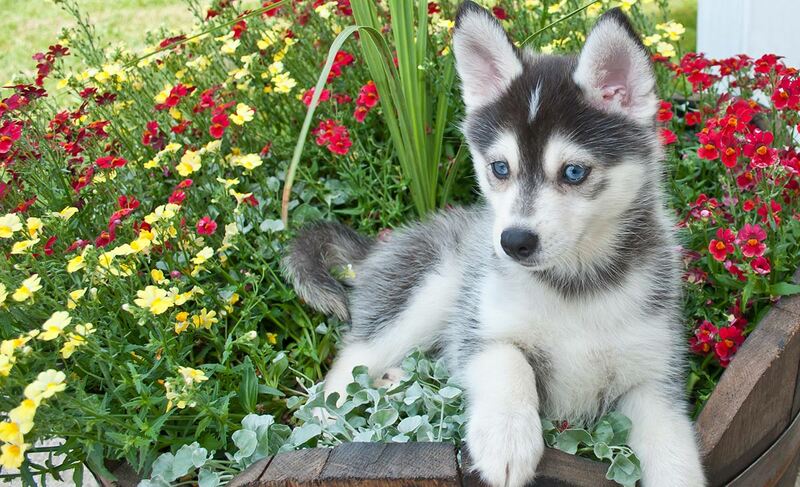 A Pomsky can weigh anywhere from 10 to 25 pounds depending on the influence of each parent dog. The typical Pomsky lifespan ranges from 13 to 15 years. To learn much more about the husky cross Pomeranian dog, be sure to read through our in-depth Pomeranian husky guide. 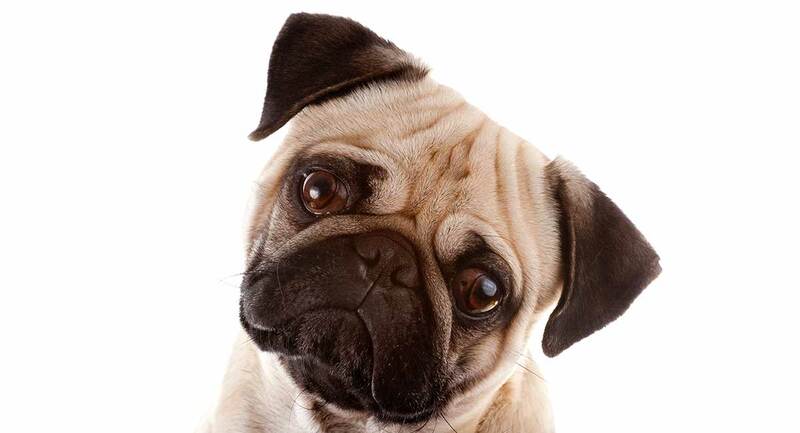 The PomaPug is a hybrid dog breed that has one Pomeranian parent and one Pug dog parent. The Pomeranian cross Pug is going to be a unique hybrid breed no matter which parent dog a given puppy most takes after. Pugs are a breed apart, being known to be quirky, stubborn yet docile overall, very loving and near-universally enthusiastic about food. Size-wise, a PomaPug can weigh anywhere from five to 16 pounds. The typical life expectancy for a Pomeranian cross Pug is 12 to 16 years. The ShiPom, Pomtzu or Shiranian are the most popular nicknames for the Pomeranian cross Shih Tzu mix breed dog. 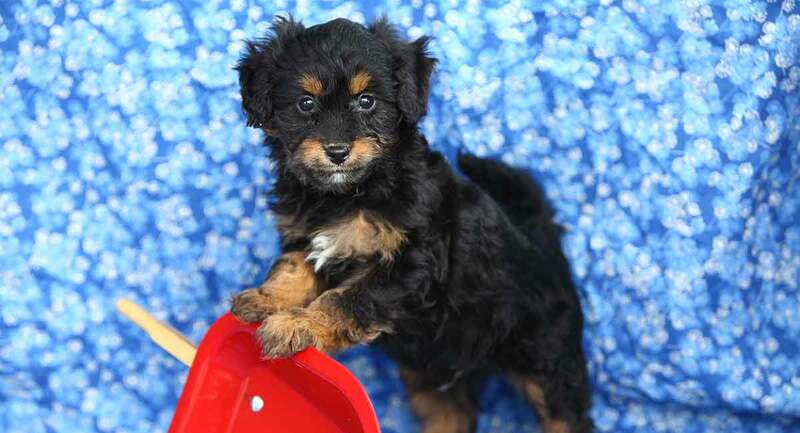 This pint-sized pup is full of personality – a true teddy bear come to life! The Shih Tzu has a long and ancient lineage as the “lion dog” companion to nobles. This is a dog that is literally designed to sit in the lap of luxury! The Pomeranian was originally a much larger dog size-wise, pulling sleds for long hours each day. Today’s Poms may be much smaller than their canine ancestors, but they clearly don’t realize it! The typical adult weight for a ShiPom cross is between 9 and 16 pounds. The average life expectancy for this dog is 12 years but can be as long as 18 years! Learn much more about the ShiPom by reading our comprehensive breed guide. 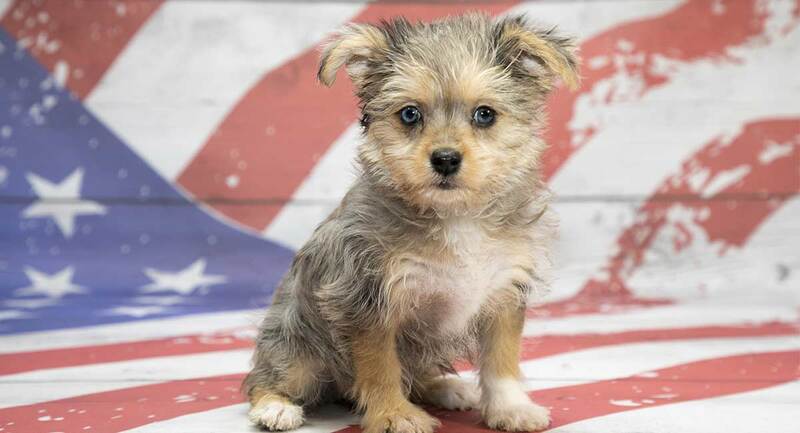 A Pom Terrier, as a Yorkshire Terrier Pomeranian mixes is nicknamed, is going to be an adorable dog! Both parent dogs – the Yorkshire Terrier and the Pomeranian – are used to keeping celebrity laps warm on practically every continent. 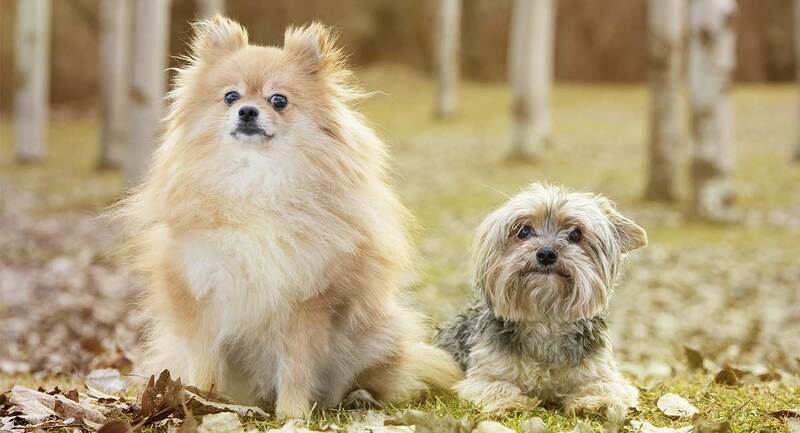 A Pom Terrier may look bigger than she is if the puppy inherits the Pomeranian’s super-fluffy coat. But these dogs rarely weigh more than seven pounds even in adulthood! Because of their extremely small size at 3 to 7 pounds, the Pom Terrier isn’t a great pick for families with small children. These dogs can get underfoot and become injured all too easily! But they are great pet dogs if your children are older. The typical life expectancy for a Pom Terrier is 12 to 16 years. To learn more about the precious Pom Terrier hybrid dog, be sure to read through our comprehensive mix breed review guide. The Pomimo is a hybrid dog with one American Eskimo parent and one Pomeranian parent. In addition to the nickname Pomimo, these dogs are sometimes called Eskipoms or Eskiranians. A Pomimo is a particularly intriguing hybrid, since both the Pomeranian and the American Eskimo dog breeds have a long lineage as sledding dogs! This means you are likely to find that your toy-sized pup is quite smart, active and energetic as well as very loyal and social. An adult Pomimo typically weighs between 10 and 17 pounds depending on which parent dog a puppy most takes after. The typical Pomimo lifespan ranges from 10 to 12 years. To learn more about the fluffy Pomimo, head on over to check out our comprehensive hybrid dog breed guide. A Maltipom, as this cute nickname suggests, is a hybrid puppy with one Maltese parent and one Pomeranian parent. Both the Maltese and the Pomeranian come from a long lineage of noble dogs bred to be companions to royalty. These dogs can be great pets for families, but just be careful if your children are still quite small since the Maltipom can be easily injured with too-rough play. The Maltipom is going to be quite a small pup weighing between three and seven pounds as an adult. However, you can expect that your Maltipom won’t realize how little he is – these dogs have big, lively personalities for sure! The Maltipom’s average life expectancy ranges from 12 to 15 years. 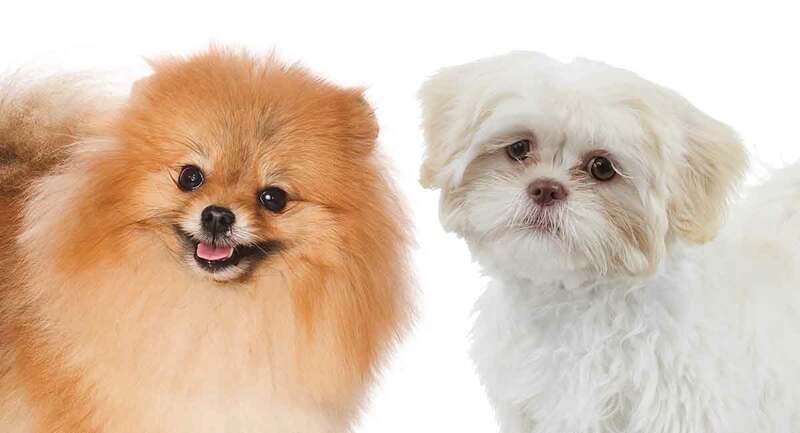 To learn more about the Maltese Pomeranian mix dog, read through our in-depth review guide. A Pomeranian poodle, or Pomapoo as this cross is nicknamed, has one Pomeranian parent dog and one Poodle parent dog. Most commonly, a Pomeranian cross Poodle will cross a Pomeranian with a miniature or a toy Poodle rather than a standard Poodle. This will produce a very petite pup that weighs 3 to 9 pounds in adulthood. Both the Pomeranian and the Poodle are very smart dogs and also very loyal with a strong need to be with their families. A Pomapoo may not be the best choice for a family with very young children because this dog is fragile physically and may also be less tolerant of rough play or handling. The Pomapoo’s average lifespan is from 12 to 14 years. To learn more about the Pomeranian cross Poodle mix, you will enjoy reading through our in-depth breed review guide. A Border Collie Pomeranian mix is one of the less common hybrid pairings, but this crossbreed pup has a lot to offer to the right person or family! The Border Collie comes from a long lineage of herding dogs with smarts and energy to spare. The Pomeranian can trace its roots all the way back to German spitz dogs that worked as sled dogs in very harsh weather conditions. The Border Collie Pomeranian is typically one of the larger Pomeranian cross dogs, weighing in between 10 and 30 pounds. However, it is not out of the question that your full-grown pup could weigh less than 10 pounds depending on which parent dog the puppy most takes after. A Border Collie Pomeranian mix can live 10 to 13 years on average. To learn more about this unique hybrid dog breed, take a look at our in-depth guide to the Pomeranian Border Collie. The PomChi, or Pomeranian cross Chihuahua, is one of the most popular of all the Pomeranian hybrid dogs. The Pomeranian Chihuahua mix may be small in size, weighing between 6 and 12 pounds, but there won’t be anything small about this dog’s personality! The Pomeranian Chihuahua is a social dog through and through – this dog really needs to be with “their” people and is very loving and loyal. However, because of the Pomeranian x chihuahua dog’s extremely small size, this dog tends to be a less ideal choice for families with small children. The PomChi can too easily get underfoot and get injured. 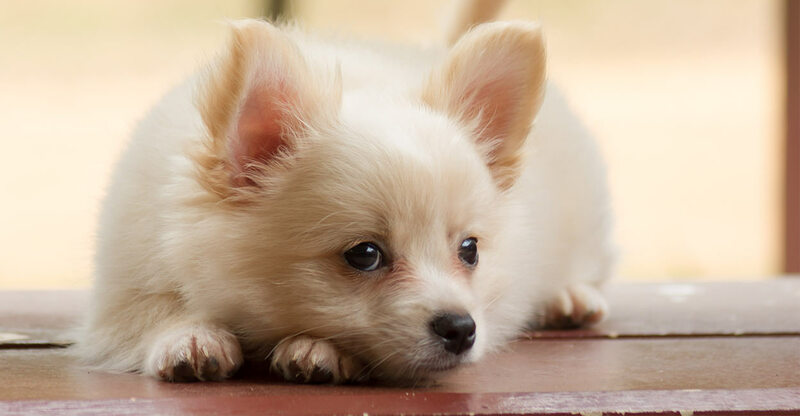 You can expect your PomChi to live from 12 to 17 years, although some dogs have lived as long as 19 years! To learn more about the precious PomChi, be sure to read the entire review guide. Which are your favorite Pomeranian mixes? Have you fallen in love with one of the Pomeranian mixes you have just met here? Drop us a comment to share your favorite Pomeranian mix! Driggers, C., et al, 2010, “The History of the Pomeranian,” The American Pomeranian Club. Sparrow, J., 2017, “Pomeranian Health & Welfare,” The Pomeranian Club UK. Vickers-Smith, L., 1999, “Meet the Pug,” The Pug Dog Club of America. Ellison, G., DVM, MS, Diplomate ACVS, 2018, “Collapsing Trachea Overview,” Veterinary Hospital of Florida. What cross is the puppy at the top?